My Buddha-boy great-nephew is visiting, and I got to hold him for almost as long as I wanted while my toddler great-niece told us toddler-like jokes. She didn’t know she was telling jokes; it’s just that everything she says makes us laugh. 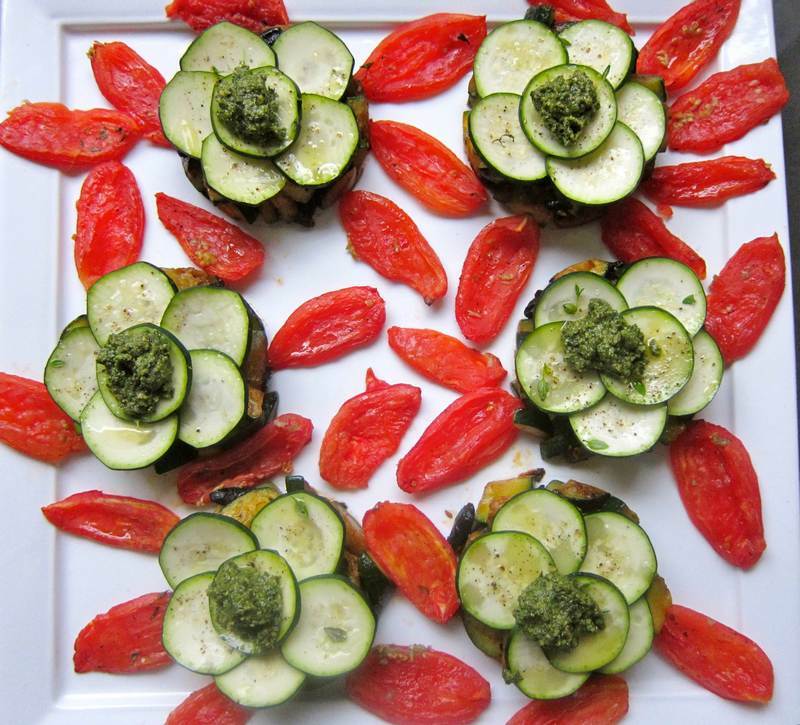 There is nothing funny about these Zucchini Lotus Flowers with Roasted Tomato Petals. They will brighten your day and make you look like a culinary champion. Heat oven to 350F. 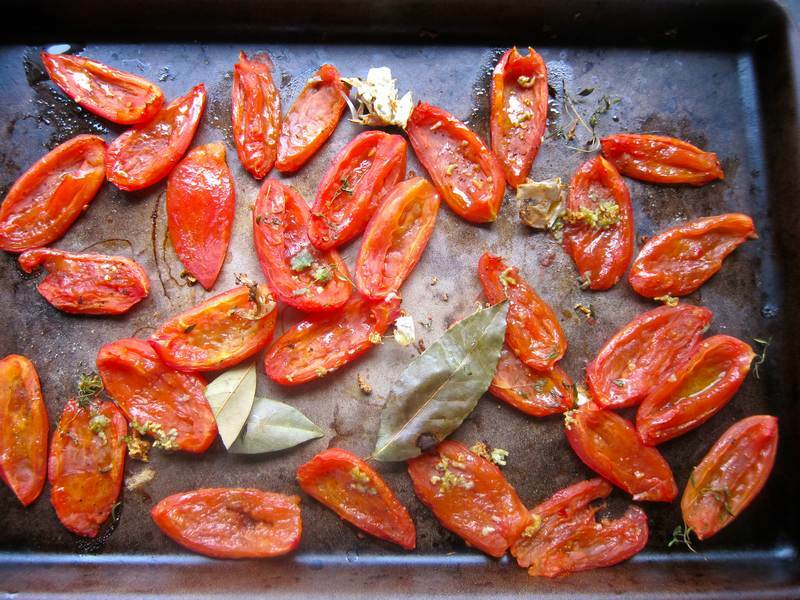 Place tomatoes on baking pan with other ingredients and bake for 45 minutes. Note: The Pampered Chef serrated peeler removed the tomato skin easily. At L’atelier des Chefs, they use the Zyliss serrated peeler. Cut 6 pieces of parchment paper to fit under the ring molds. 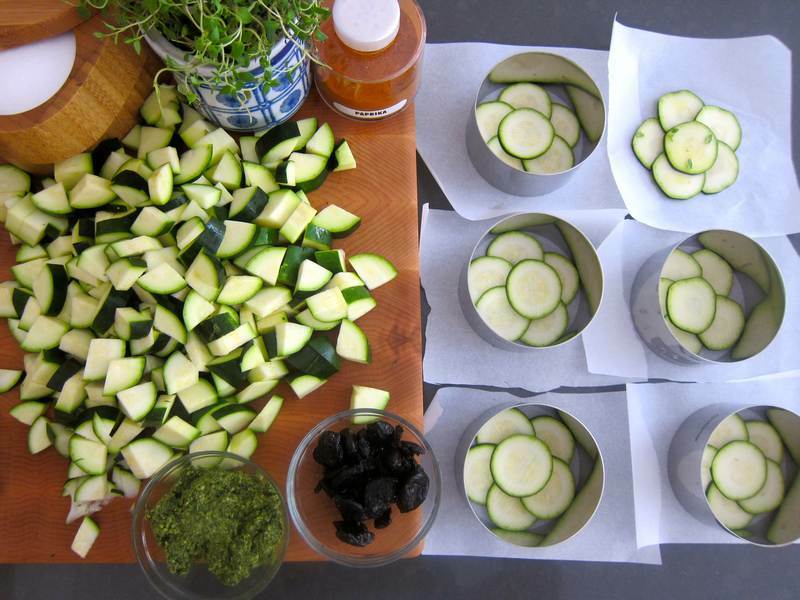 Use a Mandoline or a sharp knife to slice 6 thin zucchini rounds for each mold. Make a flower shape with the zucchini slices on the bottom of each mold. Remove mold. Sprinkle on a little olive oil, thyme leaves, salt and pepper and let it marinate for 15 minutes. Quarter the remaining zucchini lengthwise, then slice about 1/4-inch thick. Heat 1 tablespoon of olive oil in a large frying pan. Add the chopped zucchini, salt, pepper and thyme. Add paprika and more salt and pepper as required. Cook for about 8 minutes or until softened, adding the olives in the last few minutes. Place a mold on each individual dinner plate. (It is not easy to transfer the Zucchini Lotus Flowers from a platter). Divide the cooked zucchini into the molds. Push down with the back of a spoon or a mold press. Let it set for 5 minutes, then remove each mold ring. Carefully lift and place the raw, marinated zucchini flower on top of each zucchini press. Then top each flower with a dollop of pesto. Serve alongside fish, chicken or a simple pasta. Serves 6. Why do I love this recipe? The flavour is outstanding, the presentation is lovely and it follows the new trend pairing raw and cooked vegetables. 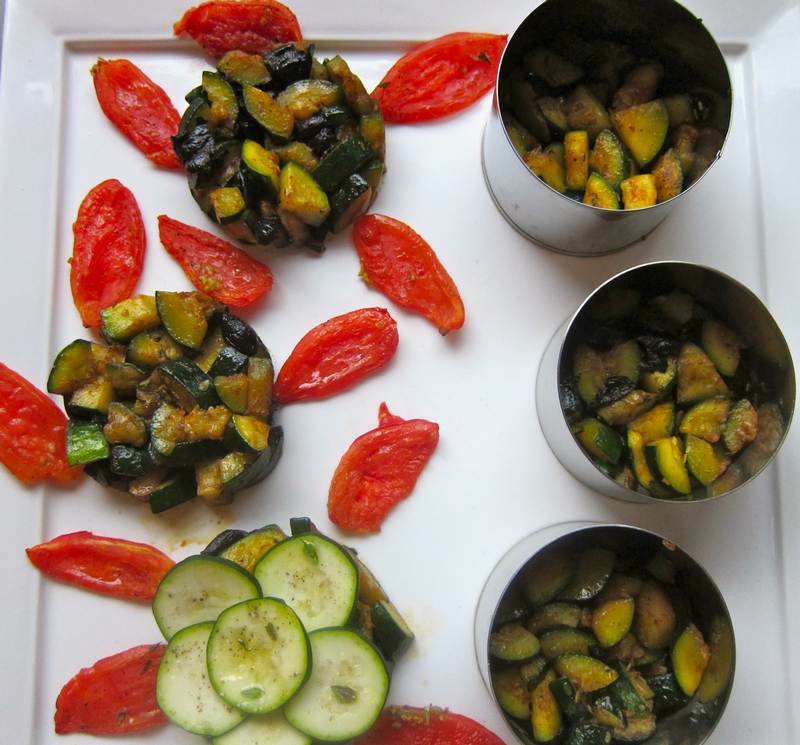 The Zucchini Lotus Flowers with Roasted Tomato Petals recipe comes from L’atelier des Chefs, an excellent, international cooking school like Montreal’s wonderful Appetite for Books. Guess which school inspired the other. Thanks Steve! 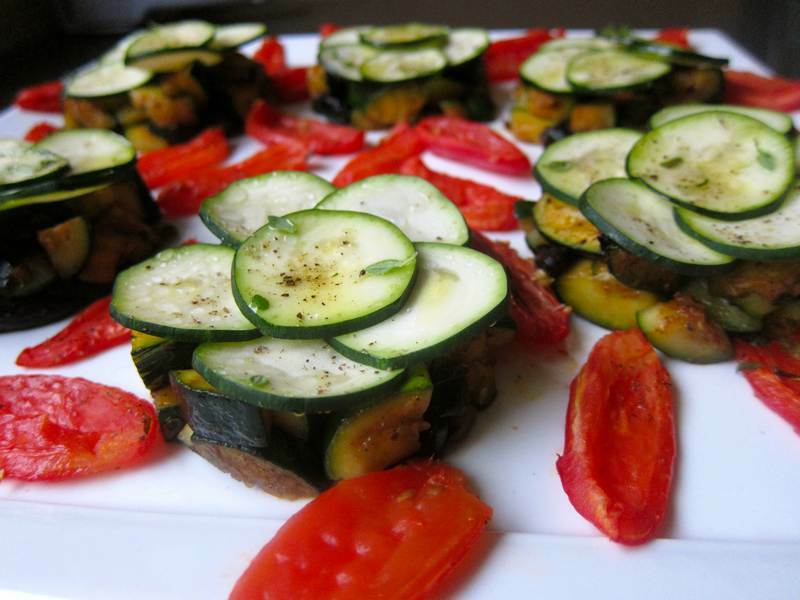 Your Sublime Flavours olive oil made both the raw and the cooked zucchini delicious! Another winner Holly – you’re on a roll!! Thanks Mimi! Will you be making this one too? Just like painting plates only the design gets consumed. And it tastes good, and it’s healthy. What more could we ask for? Thanks for liking!